The risk of death, like the risk of disease, rises with age. That much is obvious. What is less obvious is that for mortality and disease, the underlying risk dynamics—what might be called the actuarial contours of decline—are closely associated. In fact, the contours are so similar that scientists suspect that they share a single underlying cause: aging itself. So, are there such things as aging genes? This seemingly simple question is actually quite complicated. It is hard to answer directly because few datasets are available containing clinical data of genotyped individuals who have already reached the end of their lives. Consequently, an alternative to lifespan would be a convenient phenotype to guide longevity studies. One alternative that is being explored is healthspan, or the healthy and morbidity-free lifespan. It is, in other words, the healthy period of life before the first chronic disease manifestation. A recent healthspan study, undertaken by scientists based at Gero and the Moscow Institute of Physics and Technology, combed through the genetic data and medical histories of over 300,000 people aged 37 to 73. 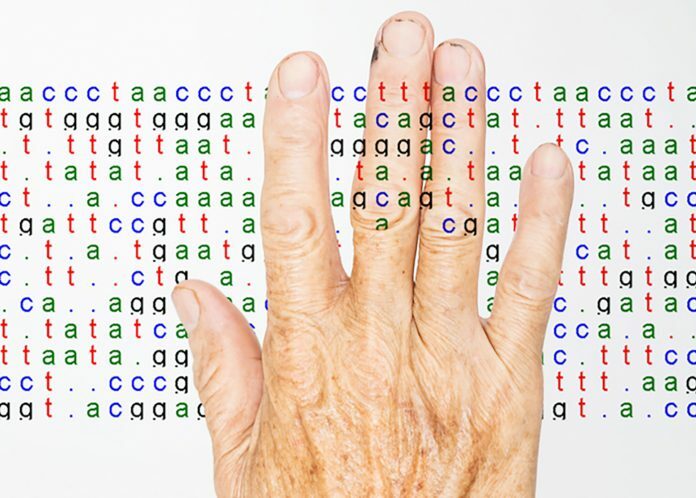 The data, made available by UK Biobank, enabled the scientists to identify 12 loci associated with healthspan at the whole-genome significance level. Details from the study appeared January 30 in Communications Biology, in an article titled, “Identification of 12 genetic loci associated with human healthspan.” The article asserts that the most prevalent chronic conditions—cancer, diabetes, chronic obstructive pulmonary disease, stroke, dementia, and some others—apparently share the common underlying mechanism, that is, aging itself. Of the 12 single nucleotide polymorphisms (SNPs) found in the study, 11 increased risk both in discovery and in replication groups. Three of the genes affecting healthspan, HLA-DBQ, LPA, and CDKN2B, were previously associated with parental longevity, a proxy for overall life expectancy. Five healthspan-associated SNPs were also associated with a number of complex traits such as skin cancer, color of skin, eye, and hair, tanning and freckles, coronary artery disease, myocardial infarction, cholesterol and glucose levels, BMI, and type 2 diabetes. The researchers also found strong genetic correlations between healthspan and conditions such as obesity, type 2 diabetes, coronary artery disease, and sociodemographic factors including parental age at death, smoking, and education level. “According to Gompertz mortality law, the risk of death from all causes increases exponentially after the age of 40 and doubles approximately every 8 years,” explained Peter Fedichev, one of the study’s coauthors and founder and CSO of Gero. 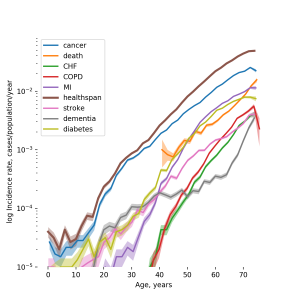 “By analyzing the dynamics of disease incidence in the clinical data available from UKB, we observed that the risks of age-related diseases grow exponentially with age and double at a rate compatible with the Gompertz mortality law. “This close relation between the most prevalent chronic diseases and mortality suggests that their risks could be driven by the same process, that is aging. This is why healthspan can be used as a natural proxy for investigation of the genetic factors controlling the rate of aging, the ‘holy grail’ target for anti-aging interventions,” said Fedichev.